What is a Layer 3 MPLS VPN and why to use it? Layer 3, or VPRN (virtual private routed network), utilizes layer 3 VRF (VPN/virtual routing and forwarding) to segment routing tables for each customer utilizing the service. The customer peers with the service provider router and the two exchange routes, which are placed into a routing table specific to the customer. Multiprotocol BGP (MP-BGP) is required in the cloud to utilize the service, which increases complexity of design and implementation. L3 VPNs are typically not deployed on utility networks due to their complexity; however, a L3 VPN could be used to route traffic between corporate or datacenter locations. In the example below we will configure three MPLS service provider routers (PEs), two routers for customer 1 (CE), and two additional routers for Customer 2 (CE). The service provider MPLS network will run a basic OSPF configuration and all customer routers will participate in BGP to reach their other sites. Both customer 1 and customer 2 must be provisioned a VRF instance to facilitate a virtual private network across the MPLS cloud. Step 1: Configure PE-R1, PE-R2, and PE-R3 interfaces and OSPF to establish basic connectivity. We will also create a loopback interface to serve as as the router-id for the OSPF process and LDP and configure the applicable interfaces for dynamic MPLS forwarding. Step 2: Forcibly change the LDP router id on PE-R1, PE-R2, and PE-R3. Step 3: Configure vrf vpn-101 for Customer 1 on PE-R1 and vrf vpn-102 for Customer 2 PE-R3 and PE-R1 and PE-R2. We will also enable the VRF on the applicable interfaces and configure an IP address on the interfaces as well. Step 4: Next configure a BGP process on PE-R1, PE-R2, and PE-R3 to facilitate advertisements of customer networks over the MPLS network. 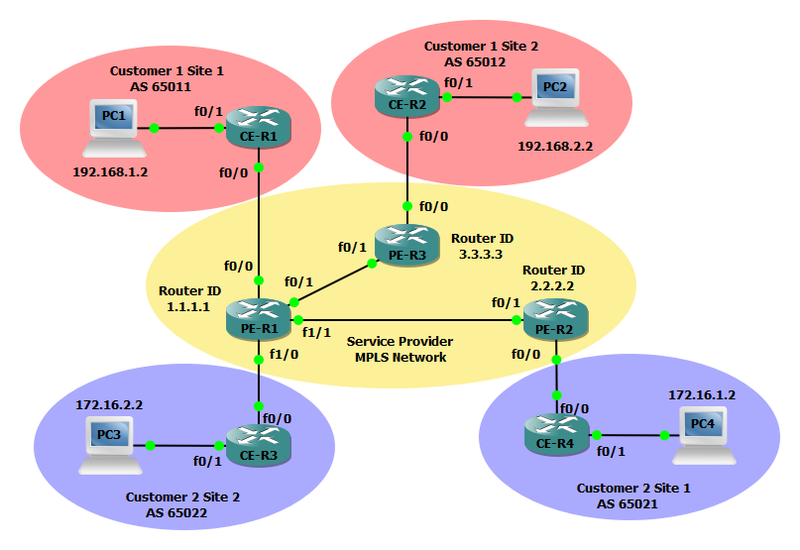 Step 5: Configure Customer 1 CE-R1 and CE-R2 with a basic configuration and make use of BGP for dynamic routing. Step 7: Configure Customer 1 CE-R1 and CE-R2 with a basic configuration and make use of BGP for dynamic routing. Now that the configuration is finished lets verify our neighbors and routes. 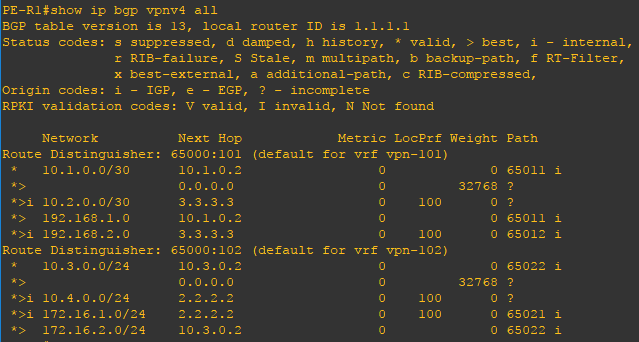 Using the show ip bgp vpnv4 all command you can verify the BGP routes distributed and to which VRF they belong. Using the show mpls forwarding-table command you can verify the mpls topology.